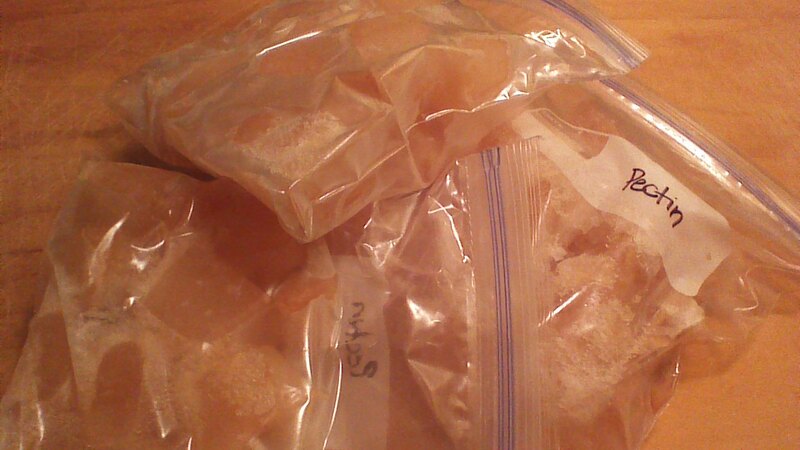 36 homemade frozen pectin cubes, worth approximately $40 in store bought pectin! Now that you’ve got the canning basics down, it’s time to save some real money. We’re going to walk right past the expensive boxes of commercial pectin at the supermarket and make our own! With just a bit of time, you’ll be setting delicious jars of jams and jellies for little to no cost. First, make your kitchen smell wonderful by simmering a big batch of cran-applesauce or apple fritters. Then, save your apple cores… we’re going to cook the pectin right out of them, and freeze the pectin to add to jams and jellies later on! 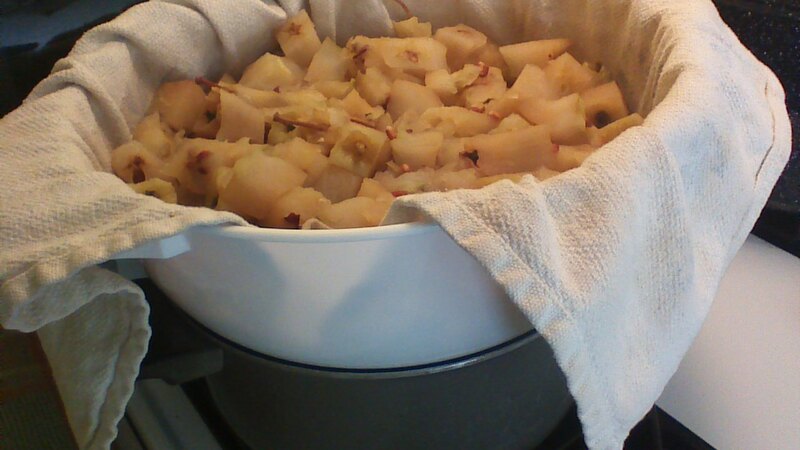 Step 1) Place apple cores in a stockpot and cover completely with water. Bring to a boil. Step 2) Reduce heat and simmer, uncovered, for one hour. Stir occasionally to prevent apple cores from sticking to the bottom of the pot. Step 3) After one hour, remove stockpot from heat. Line a large colander or strainer with cheesecloth or a clean towel. Place strainer over a very large bowl (or a second stockpot). Step 4) Pour or ladle apple cores and water into the strainer, carefully saving ALL of the liquid (that’s where the pectin is!). Gently press down on the cooked apple cores to capture as much liquid (and pectin!) as possible. 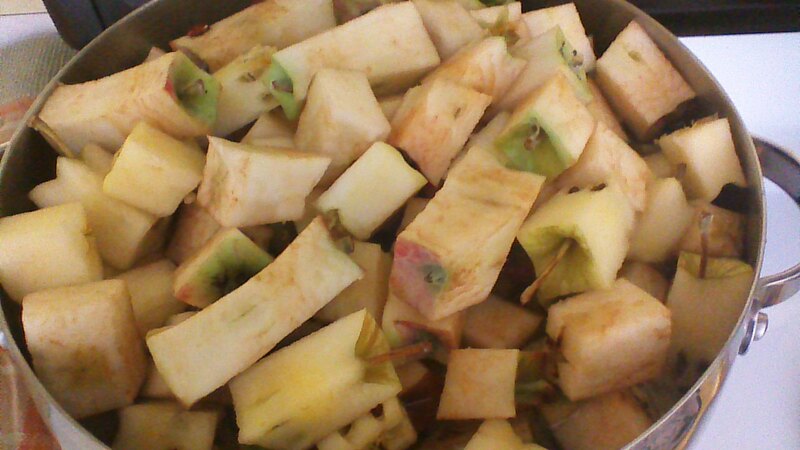 Step 5) Place apple cores in your compost bin, and pour the saved cooking liquid back into the stockpot. What you have now is diluted pectin… there’s still too much water for the pectin to be useful in setting jams and jellies, so we need to boil away some water! Step 6) Bring stockpot to a boil. Reduce heat and simmer gently, uncovered, until the volume of liquid in the pot is reduced by half. Be patient – don’t try to save time by boiling at a very high temperature, or you could burn your pectin. Step 7) Here’s an easy way to test whether your pectin is sufficiently concentrated: pour about 1/4 cup of cold rubbing alcohol (isopropyl alcohol) into a small disposable container. FOR PETE’S SAKE, PLEASE UNDERSTAND THAT RUBBING ALCOHOL IS POISONOUS… keep this out of your kitchen! Then, gently pour about 2 tablespoons of your pectin mixture onto the rubbing alcohol. 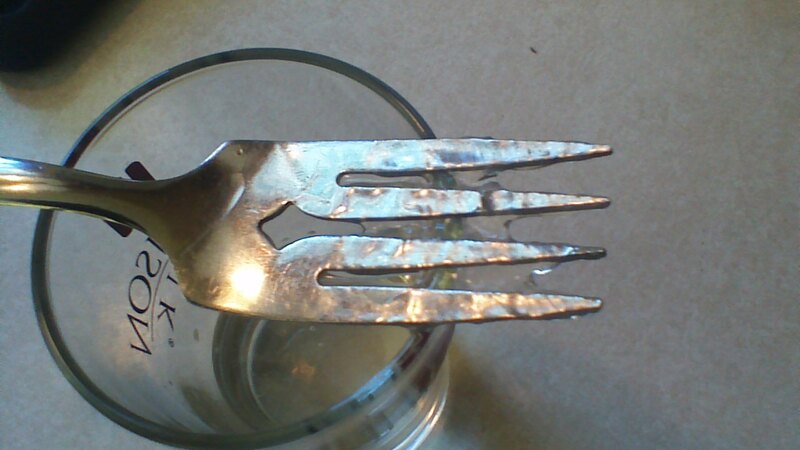 If you are able to “lift” gelatinous pectin from the container using the tines of a fork, your pectin is ready. THROW AWAY the rubbing alcohol container. If the pectin slides through the tines of the fork instead of sitting on top of the tines, your pectin needs to be concentrated a bit further. Step 8) Once your pectin is concentrated, remove from heat and allow to cool. Ladle into ice cube trays and freeze. Once frozen, remove pectin cubes and store in freezer bags in your freezer. Each pectin cube is equivalent to 1 ounce of liquid pectin in canning recipes!